Get the result as you apply them~! For the dry skin use a spoon full of renewed cream. I have some trouble with the pimples but didn’t experience trouble for keratins so I don't have that much of attention for renewed cream. For the oily type skin there is a equation. So there are some people who avoid using nutrient cream. I have some pimples and its oily type skin so I avoid using cream cosmetics. However as I get old I need to use renewed cream. One of my friend used this which she had a really dry skin. After she used it her skin became more moisturized and looking healthy. So why is this so expensive? The price was in the persistence of the cream. It is very moisturizing until the nighttime. The shininess disappears on the daytime and turns out smooth during the night. I used most of the nutrient creams that said to be good but it was too glossy and slow to absorb. So it was hard to finish one container. The result of trying out this product was that it was glossy like other cream and little bit sticky right after the application. However the speed of absorption was faster than other nutrients cream. It is really light and breaks the stereotype of nutrient cream = oily. Recommended to severe dry and dry skin type. For the people who are middle type skin can use when you feel dry because of the cold wind. Also for mixed skin type that have dryness on the cheeks will work nicely when you apply on the place. The texture is different compare to other nutrient creams. 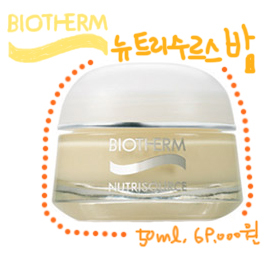 It is a balm type so it lacks on the application however the speed of absorption is fast without stickiness. It is recommended to people's skin who was fine during the summer but have pulling feeling when the cold wind blows. When the moisturizer cream can't remove the dryness than try using this. Contain is much richer than the moisturizer cream. So dry type skin could feel their skin to be healthy. I think it is made for dry skin type. However for the severe dry skin it isn’t enough. How do you take care of dry type skin? Trying to cover the white keratins with the nutrient cream is a wrong so first remove the keratins. Also for the dry type skin do the scrubbing 3 days apart and it helps to remove the keratins as well as increase the production of oil in the skin from the stimuli from the scrubbing. After the scrubbing apply nutrient cream. However you might see at the first few minutes or hour it will be moisturizing but soon after it will raise the white keratins. So for me I wipe off with Clinique clarifying lotion. Also it works for the lip if it doesn't work on lip balm. You can neglect the lotion and go straight to the cream after the skin. Nowadays nutrient creams are just good as lotion. specialize in producing high quality peptide, custom peptide and other related products. Thanks for sharing your views. 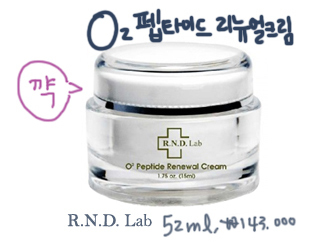 Great blog here R.N.D Lab O2 Peptide Renewal Cream.. It’s hard to find quality writing like yours these days. I really appreciate people like you. I would like to thank for the efforts you have put in writing this blog. I am hoping the same high-grade blog post from you in the upcoming days as well.